April | 2017 | You can't evict a Movement – You can`t evict Solidarity! In the morning of Wednesday the 5th of April, the police, led by an OPKE unit, evicted a house in Ano Poli, Thessaloniki. Under the threat of fire-weapons, 13 people were arrested and brought to the police station in Monastiriou. The cops refused to let the arrested use their right to contact a lawyer and get translators for 5 hours. 9 people that came to in solidarity were also brought to the “megaron” and kept 3 hours for identity control. One of them now faces the charge of resistance after the pigs beat him up. After 32 hours, only 12 people were set free before the trial, one being kept imprisoned for having no paper. He may stay in up to six month for this only, and is also accused, like the others, of both squatting and damaging private property. The asylum process in Greece is still so insufficient that thousands of people are not able to obtain a “legal status” and have therefore no possibilities to get access to accommodation or other forms of support. Living in a squat is often the only option they have. Over the time, Albatros was a home for a lot of people. Their “nationalities” do not matter. We live together, we fight together against the violent oppression of a society that wants us unequal and divided. We fight the oppression of a police-state and its system of borders and papers ; we refuse its authority like any other kind of power. Albatross was not a squat formigrants opened by western europeans, the house was opened by people with and without a “legal” status in Greece. By creating a home and a community where there’s space for everyone who wants to be part of it, we want to show an alternative for this cage that has been created and that has to be kept up with guns and walls. We do not need and we do not want authorities to govern us, we organize ourselves, because we know and we can see every day that humans are very well capable of living without hierarchy. We live and create together with people that have been stripped of their rights and that are refused a part in this society, because we believe that the only way of counteracting a system of closed borders and an always-growing militarization of society is if we are claiming back what they want to take from us: our voices, our dignity and our humanity. We fight the property system that divides us between rich and poor by using the houses left empty when so many people live in the street. Property is not safety, it is violence. This house was made suitable for living again without money, using material found in the streets and in the trash. We did this because we want to show that in this society people do not have to be poor (as we are told by our governments), but that on the contrary this system is creating tons of “trash” on the one side, while on the other side people are left to starve. Without money, hierarchy or a “legal status”, a house left abandoned to fall in ruin was made into a home for free people willing to self-organize. 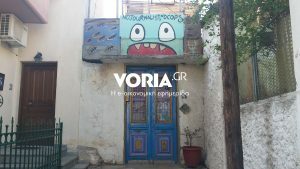 Albatros was an answer to the politically motivated evictions of three squats in the summer 2016 in Thessaloniki that left many without a roof. The eviction of Albatros is also a political decision, considering the context of repression against squatting (and especially the “migrant squats”) and the fact it happened on the very next day after a protest about this precise topic, when the accusation of the “owners” apparently dates back to December. Repression will not stop our struggle. You can take our house and you can try to deprive us from our liberty but you will not silence us from speaking out and struggling against fascism, racism and every kind of violence and injustice. We call everyone interested to show support this Tuesday 11th of April at 12 at the courthouse of Thessaloniki. No house in the hands of the capitalists ! This entry was posted in Albatros, Albatross, General, Griechenland, Hausbesetzung, Protest, Prozess, Repression, Solidarität, Thessaloniki and tagged 2017, Albatross, Griechenland, Hausbesetzung, Prozess, Repression, Solidarität, Squat, Thessaloniki on 2017/04/08 by can't evict solidarity. Stufe einer neuen Runde von Angriffen einleiten. ein begeisterter Implementierer des EU-Türkei Abkommens der Schande. gegen alle Beispiele des menschenwürdigen Wohnens einsetzt. sind. Wir akzeptieren nichts anderes. This entry was posted in Athen, General, Griechenland, Hausbesetzung, Lesbos, Protest, Repression, Solidarität and tagged 2017, Athen, CityPlaza, Griechenland, Hausbesetzung, Lesbos, Moria, Protest, Squat on 2017/04/07 by can't evict solidarity. Nach den Raeumungen dreier Refugee-Besetzungen in Thessaloniki im letzten Jahr und der zwei weiteren Haeuser in Athen vor drei Wochen, scheint der griechische Staat seine Ankündigung alle Besetzungen raeumen zu wollen wahrmachen zu wollen und eskaliert die Situation weiter. Albatros was a privately owned house in the old town of Thessaloniki, that was squatted past autumn by internationals. This is an image of Albatros squat, publishing in a local web site six days ago, in an article announcing coming evictions of squats. Albatros was a rather small squat, mainly internationals were living there, but also a good number of migrants, especially the period after the eviction of Orfanotrofeio and the other squats in Thessaloniki, while the “refugee camps” around Thessaloniki were still full (during last July NoBorder Camp there were 27,000 migrants living in camps around Thessaloniki, now there are less than 3,000). We call for your solidarity! This entry was posted in Albatros, Albatross, General, Griechenland, Protest, Prozess, Repression, Solidarität, Thessaloniki and tagged 2017, Albatross, Griechenland, Hausbesetzung, Prozess, Räumung, Repression, Solidarität, Squat, Thessaloniki on 2017/04/07 by can't evict solidarity.